We used several sources for planning information including the The Hayduke Trail book which is good but a bit maddening in that the route is only described in an east to west direction, and severely so. It is really hard in places (usually critical, like west of the pass in the Circle Cliffs) to envision the description in reverse. The maps are only for general planning purposes and the way the mileage points are done in the route description sections are very confusing as the mileage point/location is for where you will end up after following the written description, not where you are. The single best resource is Andrew Skurka’s Hayduke Trail Hiking Resources Bundle for $35, which is a very good value (he did a modified east to west through hike in Feb./March 2009). It is very thorough, has maps ready to print if you want them in UTM and you follow the route exactly. Good spreadsheets on water sources, mileage points, etc. You need to have Nat. Geo Topo for Utah and/or Arizona (which appear to be discontinued now) if you want to work with the maps. I re-did the maps for our route deviations and set it for Lat./Long. as we were using a GPS data logger, if we needed it for exact location only, which displays coordinates in Lat./Long. I had the maps printed in color on 11”x 17” paper at FedEx/Kinkos as per Skurka’s instructions and the 40 maps/20 sheets cost $80, not the $1.50 per sheet he suggests. We did copy and carry (on a few sheets of double sided paper for each section) the guide book descriptions and Skurka’s additional notes. Here is a link to Wired’s (Erin Saver) 2015 Planning page with lots of new resources for planning including Li Brannfors’s maps and Buck-30’s update notes to Skurka’s files. Dave Snowberg and Michelle Dodd in 2009, very thorough with mileage charts (they were doing a leisurely ~12 miles a day), equipment lists and blog posts. Will Tarantino in 2009, almost exactly same dates when we went through. They were flying along. Generally folks go east to west in the spring as the starting elevations are lower with less snow or west to east in the fall for the opposite reasons. We wanted to get over the Henry Mtns. before snow fall too. The other variations we included (as did Choi and Tarantino) were to go through Canyonlands via Salt Creek (more water, lots of archeological ruins, more striking?) instead of Butler wash. To do this we were also going to skip Young’s canyon/Fable Valley and go on up Dark Canyon and out either via Trail canyon or a bushwhack out Poison canyon and walk the forest road to Salt Creek. After a resupply in Canyonlands we were going to walk through the heart of the Needles, which the Hayduke route misses, and reconnect with the route near the Confluence of the Green and Colorado rivers. The through hikers we ran into also commented on how the route missed the best part of the Needles. Here was our whole plan. Mostly designed around water availability, trying to minimize the amount of water we had to carry by hitting a water source every evening or at least late in the day and resupply points. Shorter mileage days early on with longer days later and at sections with lots of road walking. 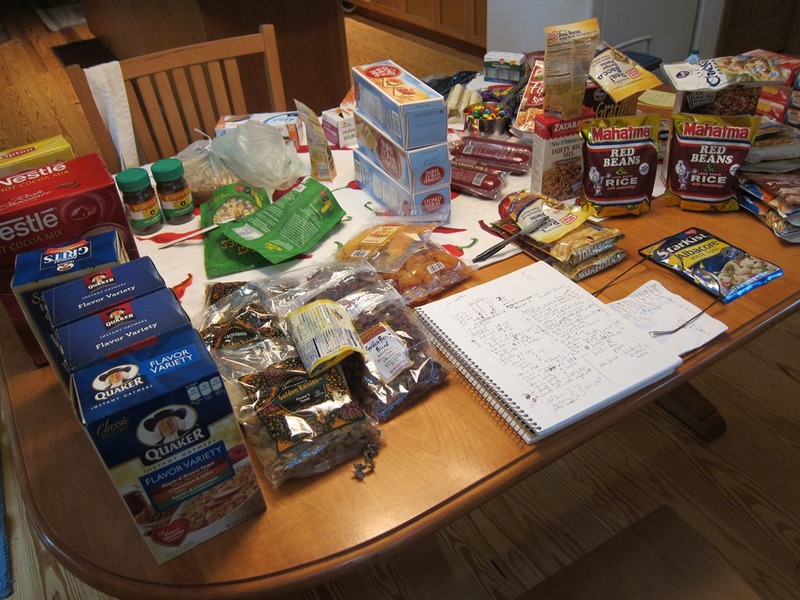 Our resupply points conveniently worked out to be every 6 days. I won’t comment on resupply points for the entirety of the route but a lot of folks take an alternate route through the town of Escalante for resupply, either missing the lower Escalante and Coyote Gulch or trying to hitch hike down the Hole-in-the-rock road to get back to it. If we hadn’t had a car at the Burr Trail we would have buried/hidden a bucket there but it is nearly 40 miles (mostly dirt) down the Notom-Bullfrog Rd. or down the Burr Trail from Boulder (last 4 miles dirt). The information about Hite is confusing from all sources, including calling the store (435-684-2278). Some info says they are closed in Nov. or the hours are only 11:00-1 or 2:00 in Nov.. In the end they were open 8:00 to 5:00? but closed the day we got there because the lady was having a baby (our package was at the ranger station across the road 435-684-2457). We were going to drop a package but they actually preferred us to mail it to: PO Box 501, Hite, UT 84533 or you can UPS to: Hite Store, Hite, UT 84533 but call first to make sure. The one problem with mailing is that you can’t mail fuel canisters so we carried the fuel for the 2nd and 3rd sections from the car on the Burr Trail. We were not able to get into the store so cannot comment on what kinds of food and supplies they actually stock. Canyonlands is another can of worms. Forget about sending or leaving a package with Needles Outpost as she hates Hayduke hikers, we called several times and got the same story each time. The visitor center at the park will also not hold packages/buckets (even though we did hear from some through hikers that they did let them leave a bucket out back) and do not want any caches left inside the park. In the end Lee hid a bucket just over the boundary of the park, a mile or so from the road to Needles Outpost. 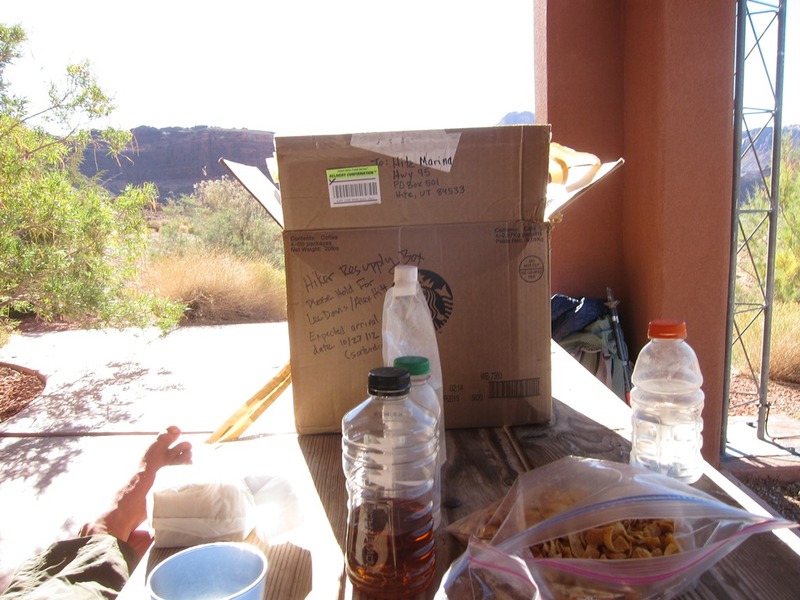 2014 Update– Canyonlands Needles Visitor center will now hold boxes, see the information in the last comment below. We did have a permit from Canyonlands ($30) for the nights we planned to be there and they were helpful by mailing it to us knowing that we were walking in and not coming by the visitor center. We were to call from Hite to make sure we were on schedule, etc. The only other place that we technically needed a permit was in Glen Canyon Nat. Rec. Area and Capital Reef N.P., I do not think that they will mail them but they are free and the Interagency Visitor Center in Escalante (435-825-5499) can write permits for both (and Grand Staircase-Escalante N.M.) so you don’t have to stop by the Capital Reef visitor center. I had a ranger at Canyonlands ask me how hard it was to find the route, he had heard that you had to be really good and be able to tell the difference between a deer trail and an elk trail. Not so much but you do have to be confident and experienced with off trail travel. The big scale route finding is mostly easy, up this canyon, down this wash etc. It is at certain points that the small scale route finding has to have your attention, in and out of certain canyons happens at only one point for example. We had more trouble on Swap Mesa finding the best cattle trail but it wasn’t too hard to get back to where we needed to be. Similarly when following some roads it was a bit confusing, I think made worse because I had somehow printed the maps out with the street layer which obscured the roads on the regular topo and made it difficult to tell which roads actually existed on the ground. We did have a tiny GPS data logger (Holux M-241) that we would turn on only when we wanted to make sure of exactly where we were. In 12 days we turned it on maybe 12 times. We could have used the compass to triangulate our position but we felt it was faster and more accurate to use the 1.9 oz. GPS. Mostly you need to keep the map out and refer to it often when traveling confusing areas. As I said above it is much harder to follow going west to east by the book description, so you have to interpret. There are also no trail markers of any kind other than a few cairns on a few of the critical entrance/exit points like Swap Mesa and Tarantula Mesa and they are not marking the top and bottom but along the climb to let you know you are on the right track. Despite the early exit this was a great trip and we/I learned a lot more about long distance hiking, especially in desert country. We had prepared well and planned well. The sad thing is that other than the foot issue everything else was working perfectly, all the other equipment was just fine, we both felt really good physically even when we started doing longer days. The resupplies worked well, we had even increased the volume of food slightly as we knew our appetites would increase as time went on. But in the end if you can’t walk that changes everything. So what happened with the foot? 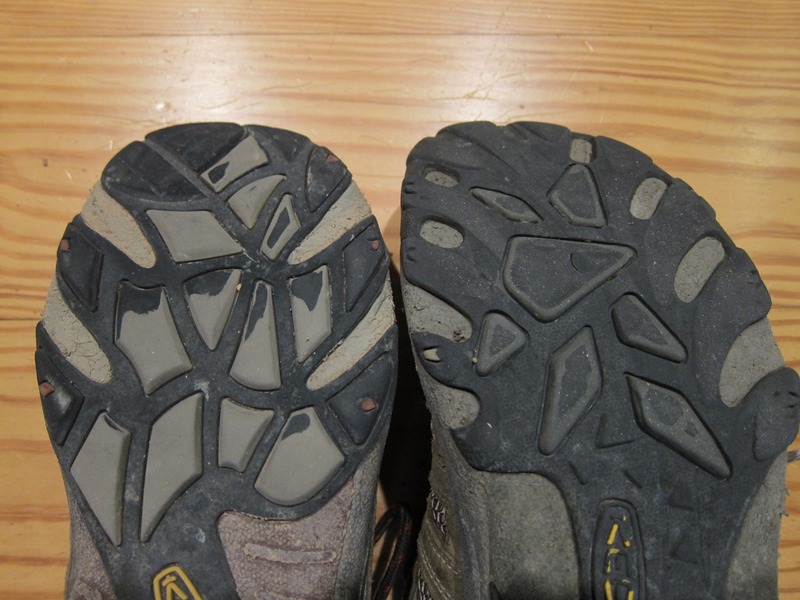 I am sure that it is a combination of things that caused the initial hot spot including too much sand and stuff in the shoes. We were good about stopping to clean out the shoes and airing the feet during breaks. I have never used low gaiters but in this country it might be a good choice. Lee had them and he did have less crap in his shoes. We were trying to wash out socks every day, if we could, to keep them as clean as possible. I do think I made a mistake in the choice of shoes themselves. 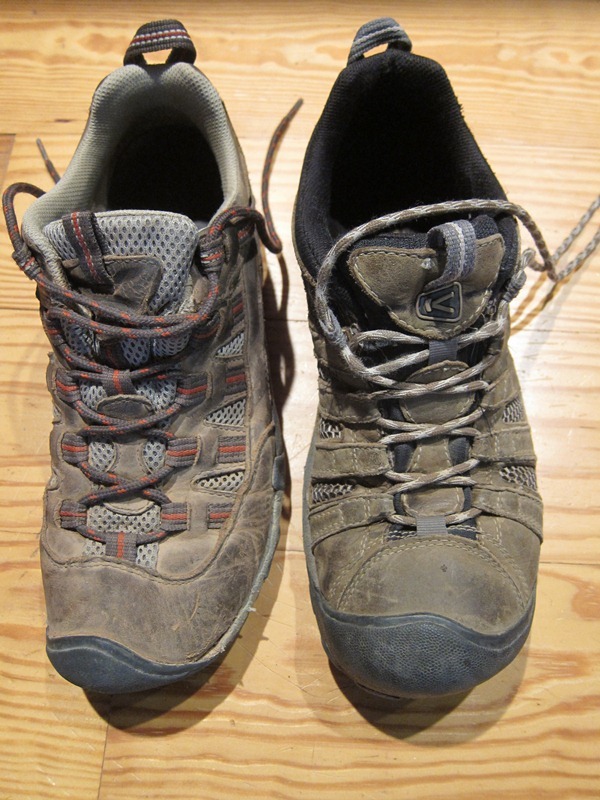 My standard desert shoe has been the Keen Voyageur which has been great. I was looking for a shoe that could do the wet sections and the rockier dry parts. On the two Paria river trips I used the Dunham Alcatraz shoes (no longer available) that dried well, kept most stuff out but didn’t have the front of the foot support/protection needed and I would end up with basically stone bruised bottoms of the feet. I ordered a pair of Keen Alamosas that were advertised as more for water than the Voyageurs because of the waterproof nubuck leather and thinking that I really liked the Keen fit. They are not the same fit and in particular are narrower in the toe box. I went ahead and trained for the walk in them, walking with the pack for nearly 60 miles beforehand with no problems. In the end they were a bit too narrow, did not drain or breath as well as I needed and even began to accumulate fine sand between the liner and the outer which was working on my small toes. They also had a different lug pattern from the Voyageurs with one big lug directly under where the blister developed. In dealing with the hot spot/blister, we all carry knowledge in our heads and stuff in our packs based on our accumulated experiences. I had never had a blister on the bottom of my foot and it had been a long time since I’d had any blister anywhere but my first aid kit had materials that had, in the past, taken good care of heel and toe issues. We tried many things to clean the area to help make things stick better including hot water, alcohol (hand sanitizer) and iodine/TSP wound cleaner. We tried different bandages/coverings with different adhesives (Band-Aid Blister blocks, moleskin, waterproof first aid tape, duct tape). I even tried to alter the shoe to relieve the pressure by cutting down the lugs on the sole that where directly under it and making an additional card board insole with a hole cut in it under the blister. I now know what it is I need to have in the kit. I have found this excellent site and article on dealing with blisters by someone who regularly doctors ultra-marathoners with really heinous foot issues. I ordered from Zombie Runner– alcohol wipes to clean the area well, tincture of benzoin that is a “tape adherent” which makes the area really sticky, 2nd Skin Moist Burn Pads that are similar to the Band-Aid Blister Blocks but can be cut to size and then Kinesio-Tex tape which is water resistant and breathable but has a very sticky adhesive to hold it all down well. Out goes the moleskin and the Band-Aid Blister Blocks. Temperatures were warmer than normal, we expected 60’s and 30’s with some nights in the 20’s but especially the first week we had highs near 80 and lows in the 40’s. For the longer trip I had my 20 degree sleeping bag instead of the 35 degree bag along with a very thin pair of long john bottoms that I never wore but might well have needed later on. I also carried a very light (6 oz.) Driducks rain jacket in case we did have some rain but it never came out of the pack. I could have done the 12 day trip with the lighter weight sleeping bag and less clothing but was very comfortable all the same. My starting pack weight with 6 plus days food and 2 quarts of water was about 28#, the heaviest was leaving the Burr trail with 6 days food and 6 quarts of water at about 35#. You forget how very very fine the sand is in Utah and it gets into everything even if you are very careful, add wind and there will be casualties. My Canon s90 camera lens would not zoom after the first few days but works fine otherwise and my new Petzel e-lite headlamp worked great but the switch was hard to move because fine sand jammed it up. With this long a trip I had to really think about food so it was varied and I wouldn’t get tired of eating the same thing over and over. The best new addition was bringing shelf stable bacon pieces (found with the salad dressings in the grocery store). I would use it in a potato dish for a dinner and then save some to have with the instant cheesy grits in the morning, fabulous. To get some more vegetables in the dinners I also added some Just Veggies which are available at most REI’s or online, very good. For lunches I tested the holding ability of unrefrigerated vacuum and wax sealed cheeses, they are just fine even after a month! I alternated summer sausage lunches with some canned tuna and chicken salads that gave a good change to the palate. I also had a rotation of oatmeal, granola and grits for breakfast that I never got tired of. We did our usual sharing of dinners so over the course of 25 days I only had to come up with 11 meals of which only two were the same. This entry was posted in Equipment and tagged blisters, equipment, food, foot care, foot wear, hayduke trail, holux m241, map printing, planning, resupply. Bookmark the permalink. Fantastic trip report and planning info Alex! Might have to do this one day! How much total does a trip like this cost? It looks awesome! All of my western trips usually run well under $1000 with everything including airfare, rental car, motel rooms on either end. This one would have been more expensive if we had to pay for shuttles on either end but we didn’t. Food and supplies only cost less than $300. If you can get the additional maps for the alternates Brian Frankel took as well as his resupply pts, as I had when thru-hiking the HDT in 2009(some of this was posted on the ULA site), they might make sense, as most of them did for my hike, from water and resupply logistical and scenic perspectives, compared to the route in The Hayduke Trail Guidebook. The HDT additionally affords well worthy scenic added on trail mileage in many regards(Arches, Canyonlands, Capitol Reef, Escalante-Grand Staircase, Bryce Canyon, Grand Canyon, Buckskin Gulch/Paria River, and Zion. Best trail mileage estimate I could come up with for my hike was 1340 miles AND it was worth doing every additional mile. Agree that the Guidebook is much easier to read hiking from east to west as that’s the way the trail descriptions are written. Andrew’s HDT Mapset, which wasn’t available(or if it was I didn’t know it?) in early 2009, when I did the HDT in early spring, makes the route much more less daunting of a task from a logistical stand pt. Wow, the amount of beta now available in just several short yrs since I did it amazes me. DEFINITELY, more hikers should hike this pretty awesome route in sections or in its entirety. Thanks for the input Dogwood, I agree that the options/variations are endless and it is definitely a route folks should explore especially after they gain some route finding experience. Do you have an online trip report of your hike anywhere? I don’t have a trip report for the HDT. Even if I did it would be difficult to follow because of the frequency I interjected side hikes into the main HDT route. I also couldn’t hike the Escalante River up to Coyote Gulch on my first attempt because of high spring volume. I had to come back a differnt yr and do that sectionHowever, I’d gladly share what I know and did if specific questions were asked. Once you get Andrew’s HDT bundle you’ll possibly start noticing more worthy scenic possibilities off the main HDT route on the “big picture” maps. Even though he has included 30 x 60 minute 1:125,000 “big picture” maps with the typical 7.5 min quads printing the “big picture” maps out on even 11×17 paper is kind of tight. It would help if a HDT wanderer also had the larger(meaning larger paper area) Nat Geo Trails Illustrated maps for a few areas, for example the NPs. For example, generally I would certainly want the NG TI Map for Capitol Reef NP. And, if intending to explore off the 7.5 min quads, which is easy to get off anyhow even if desiring to adhere to the founder’s main HDT route, definitely something detailed. I haven’t carefully examined all of Andrew’s “big pic” HDT maps though. A bit of good news is that Needles Visitor’s Center(sandwiched between Squaw Flat CG and Needles Outpost) will hold a mailed resupply box. Thank You NPS! Please be conscientious of being responsible to pick up or forward your mail resupply box. In other words, let’s not as hikers abuse this service.